Self-driving cars will reshape our cities and our lives. Imagine a world with fewer automobile accidents, less road congestion, and even increased access to vehicles for older populations and those with disabilities — self-driving cars are the key to increased mobility and road safety. By some estimates, we can expect to see over 20 million self-driving cars on the road by 2030, creating more than 100,000 new U.S. mobility industry jobs in the next decade. However, the major players in the self-driving car market guard their technology and advancements closely, making it difficult to gain access to the crucial knowledge needed to enter the field. What’s more, we’re seeing sweeping demands for safer practices and more rigorous testing. Our shared vision for the industry requires us to create a talent pool focused on bringing safe autonomous vehicles to public roads. Today, we’re excited to announce our partnership with the University of Toronto to offer a first-of-its-kind Self-Driving Cars Specialization. Designed and taught by renowned instructors Professor Steven Waslander and Professor Jonathan Kelly who have more than 30 years of experience in autonomous robotics research, the new Specialization emphasizes safety and provides the latest technology and research to enable learners to enter the AV industry. The first course in the four-part Specialization is available today, with subsequent courses rolling out through 2019. The courses will teach learners how to assemble the full software stack required to define the operations of autonomous vehicles. The backbone of the learning experience is an open-sourced simulator called CARLA, which exposes learners to realistic driving conditions like extreme weather, varied lighting, pedestrians and more. By the end of the four-course Specialization, students will be able to drive a virtual car around a simulated racetrack. The Specialization is designed for learners who already have some engineering experience but little to no formal training in self-driving technologies. Upon completing the Specialization, learners can apply to in-demand jobs such as Autonomous Driving Software Developer, Autonomous Driving Engineer – Planning and Control, Autonomous Systems Test Engineer, as well as other popular roles, such as Computer Vision Specialist, Machine Learning Specialist, Deep Learning Specialist, Embedded Systems Engineer, and Robotics Software Engineer. 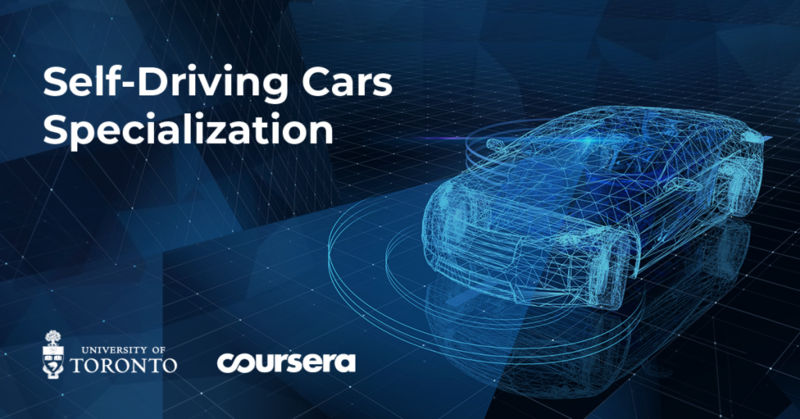 To enroll and learn more about the Self-Driving Cars Specialization, visit https://www.coursera.org/specializations/self-driving-cars.